Employing the tenets of Zen Buddhist awareness practice, the book provides numerous exercises and self-help tools for working through problems with resistance, revealing how resistance operates in everyday life and guiding readers to consider how they can be free of it. 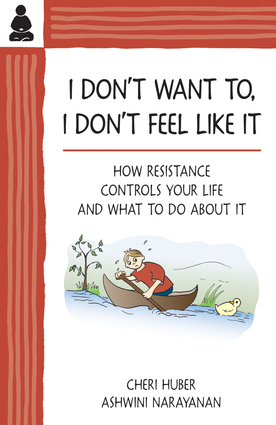 The teachings in this book show how to recognize resistance in its many forms, not take it personally, and be free of its control. The platform is that the voice of resistance—thoughts such as I'll do it later—is not personal; everyone has it. Instead, it is the voice of a survival system that can take people from commitment to inaction in a matter of seconds. Then, self-hating voices level internal accusations for not having followed through, including thoughts of failure, shame, and lack of self-discipline. Cheri Huber is the founder of the Zen Center in Palo Alto, California, and the Zen Monastery Peace Center in Murphys, California. She is the author of There Is Nothing Wrong with You; Transform Your Life; What You Practice Is What You Have; and When You’re Falling, Dive. She lives in Murphys, California. Ashwini Narayanan is a student of Cheri Huber, has cofacilitated and created workshops with her, and currently runs the operations of the two nonprofits that Cheri founded. She lives in Cupertino, California.